Ice dams are a recurring and potentially damaging (and expensive) problem for homeowners. Most every winter, you can expect ice blockage in your gutters to occur due to the freeze/thaw cycles of winter, helping to break down the integrity of the roof and gutters. The rise and fall of temperatures causes snow to melt from the top of the roof and then freeze again at the edge, right at the gutters. The downspouts then freeze closed, and the result is an ice dam that blocks unfrozen water behind it. The main cause of the large buildup of ice known as an ice dam is when heat from the rest of the house escapes to the attic then heats up the outer portion of the roof. The warm temperatures then melts snow, and that water then trickles down to the lower part of the roof where it is colder and then freezes up again. 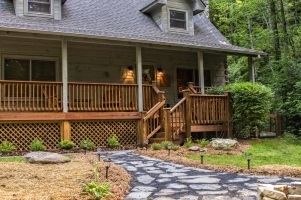 The buildup of ice on the edge of the roof will cause a blockage that will stop melting water from freely flowing down to the gutter and downspout. Often, the downspouts freeze up first, causing a blockage that loads up entire portions of the gutter with ice, compounding the ice buildup on the roof. Lack of proper attic ventilation is also a problem. Warm air is trapped in the attic with nowhere to escape, thus creating temperature difference in the roof. Ice dams can often be prevented by properly insulating the attic from the rest of the house. Even though we live in an area where snowfall is minimal, we can get some big snow storms in Colorado Springs where lots of moisture is deposited on the roof. We all know that the weather here changes quickly, and so that snow on your roof can be melted pretty quickly in a day. 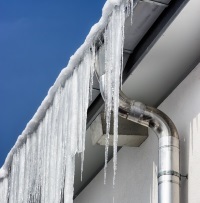 If your gutters freeze up, or they are not able to channel enough water away and off the roof, an ice dam can result. 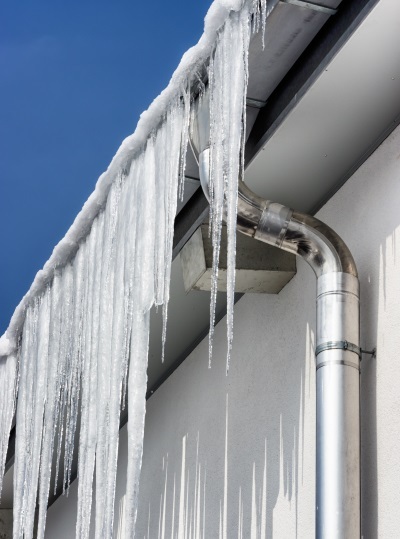 How can ice dams damage the roof, gutter and the rest of your home? The puddles of water formed by the trapped water behind the ice dam can cause all sorts of damage to the roof material. Rotting and warping of the underlying materials is very common. Since water can (and does) seep through most materials, the wooden structure beneath the shingles also normally gets damaged pretty quickly. Water can get into your attic and once this happens the resulting damage can be severe: damaged joists and other roof structures, staining on the ceiling below, stains on walls or sidings, mold forming (especially hidden mold), and the integrity of the underlying wood structures are compromised and rot can occur from within. The weight of the ice that is formed in the frozen gutters is often enough to cause the gutters to either collapse, sag or pull away from the roof edge. 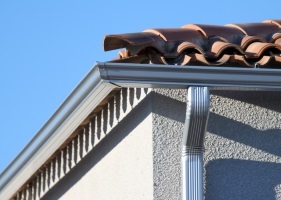 A gutter that becomes detached from the roof can no longer keep water away from the eaves and sides of the house. Water damage to the sidings and ceilings can become unavoidable. Worse, the foundation of the house might also be affected. Gutter replacement can be costly itself but that may be the least of your worries once water starts to seep into your house and cause damage to other parts of your house, all from the roof with water leakage problems. You can prevent ice dams, preserve your home and avoid costly repairs. How do you prevent ice dams? Give us a call or use the handy contact form on the right to get a free quote on your gutter repair or new installation!